How does anyone pic a favorite pic out of hundreds...dare I even say...possibly even thousands of photos of their children? It's not easy for me! This one in particular warms my heart and it so happens it was taken this morning after breakfast. It was a cloudy day but as you can see there are no cloudy days with all of the sunshine radiating from our little princess. I hope she brings a smile to your face and your world as she does ours. We had a great holiday with Kylie. Sean and I were really excited to plan ways to surprise Kylie on Christmas morning. It is especially exciting to see things through her eyes and we get caught up in her excitement. It seems like she totally gets the story we were telling her, too! She repeated it back to us like this "Santa?? Chimineee (Chimney)?? Stocking?? Presents! (with a satisfied smile on her face). Tree?? Presents! (another satisfied smile). Chimineee?? I am not embelleshing. She repeated those same words to me one evening while going through our nite, nite routine. Our two year old totally got it! We are amazed by just how much she understands. We are starting to curb our conversations in front of her because she repeats everything back to us. This has got to be the perfect age for toddlers. Kylie is such a joy to be with and she keeps us smiling constantly. She is now transitioning into the 2 1/2 year old classroom at school. Next thing you know, we will be celebrating her 3rd birthday in August. I'm not ready for her to keep growing up so fast...sigh. 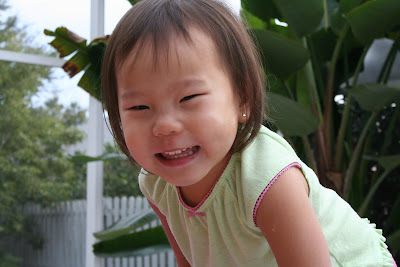 This blog was originally created to journal the adoption of our beautiful daughter from Gansu China. It has now become random thoughts as our daughter grows in leaps and bounds and we experience everyday life together as a family of 3. This is a Flickr badge showing public items from jdurney tagged with Bali. Make your own badge here.